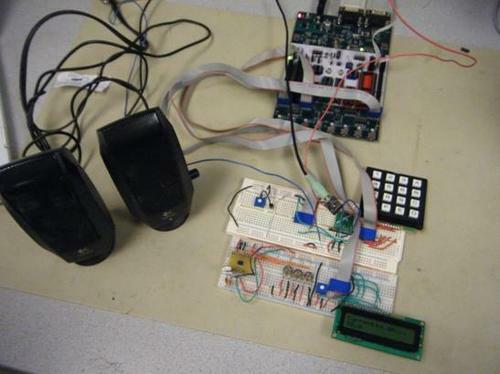 The project is a user-friendly and cheap FM radio receiver which produces the desired audio signals using integrated circuit to achieve the pre-processing units. During operation, the user is allowed to change stations and interact with the receiver by integrating a keypad and an LCD for communication. There are several functions that this radio receiver can perform including adjusting the threshold when picking up stronger or weaker stations, setting up 3 favorite stations for quick tuning, scanning up/down for next strong signal station, and tuning up/down a frequency. A keypad is designed for controlling the receiver and the buttons are mapped to their corresponding functionality while the other buttons are not connected. The 4 main sub-components of the receiver include the LCD, the keypad, the favorite station storage, and the communication with receiver. Each of them is being controlled by their software components. The antenna transfers the incoming radio signal to the AR1010 FM radio receiver. To communicate with the AR1010, the I2C protocol is used since the sample code is available online. Also, the AR1010 is powered by 3V. The button presses on the keypad are scanned by the program.